A £6m public realm project led by Altrincham Forward to transform the appearance of Altrincham town centre has converted its vehicle-dominated streets into a pedestrian-friendly environment, encouraging footfall, engagement and dwell time. The three-year development includes new street paving, the planting of more trees, wider streets, additional seating areas as well as gateway spaces to mark the entrance of the town. 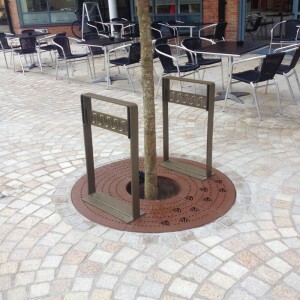 Altrincham-based design company Planit-IE – who we have worked with on a number of public realm projects – selected Goose Foot to manufacture 25 bespoke tree grilles to protect the trees as well as 8 bespoke 2.6m seats to be installed in Autumn 2015. Tree grilles have an important role to play in maintaining healthy tree pit conditions. They have each been engineered in-house using mild steel to offer the highest level of tree protection. These robust grilles are able to withstand the increasing footfall in the area and also prevent access to the roots and trunk. 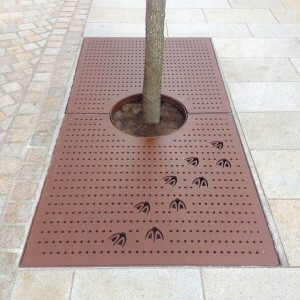 The bespoke geese patterns were laser cut in-house to match the Goose Green development scheme. The seats that are to be installed in late 2015 were manufactured using hot dip galvanised and powder coated mild steel incorporating 45mm thick Iroko slats with a half bullnose to the underside. In addition, Goose Foot supplied 12 bespoke mild steel cycle stands (all with intricate laser cut designs) and a wall mounted corner bench to fit around the Goose Green plinth. The bench consists of 60mm thick Iroko slats with 30mm radius to the underside, mild steel hot dip galvanised and powder coated. The client chose Mars 2525 powder coating to give the look of a corten finish; together with 2525 Bronze for the cycle stands. 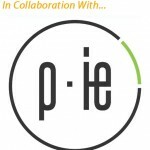 Graham Wood, General Manager at Goose Foot said: “It is a pleasure to partner once again with Planit-IE. As the local landscape architects, their passion for this project was clear. “By working closely with landscape architects, we are able to modify designs and provide suggestions for the end client (Trafford MBC) to consider and provide sign off. Altrincham town centre has been transformed by this work. Available in a wide range of sizes and specifications, our standard and bespoke tree grilles are manufactured in-house to complement any scheme, whether it’s an ultra-modern or traditional development. Our design engineers work closely with the landscape architects and primary client to ensure that all options are considered and potential issues raised. With more than 30 years’ experience in designing and manufacturing all aspects of street furniture, including tree grilles, Goose Foot are recognised as the ‘go-to’ steel fabricator for urban realm work. 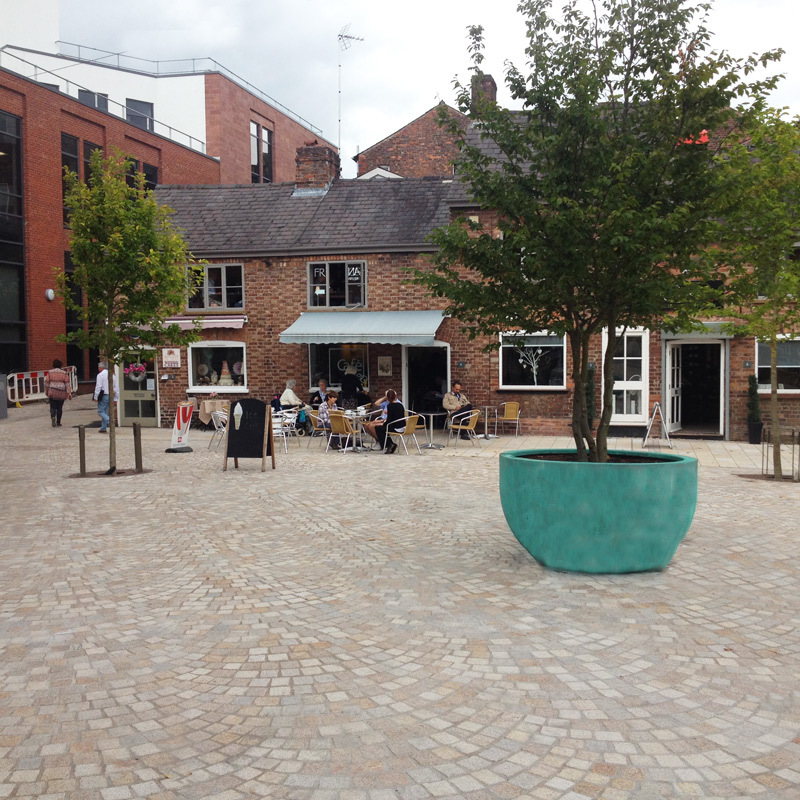 To discuss any requirements for your public realm project, please contact us today.